Kearns, a 21-year-old University of Idaho student from Lake Oswego, Oregon, is a junior double majoring in electrical engineering in the College of Engineering and physics in the College of Science. Kearns began his research during a summer 2015 internship at Intel in Hillsboro, Oregon, with his mentor, prototyping developer Andrew Lamkin. His goal was to use a computing system to receive brainwave signals from an electroencephalogram (EEG) biosensor to control other devices such as a digital camera. 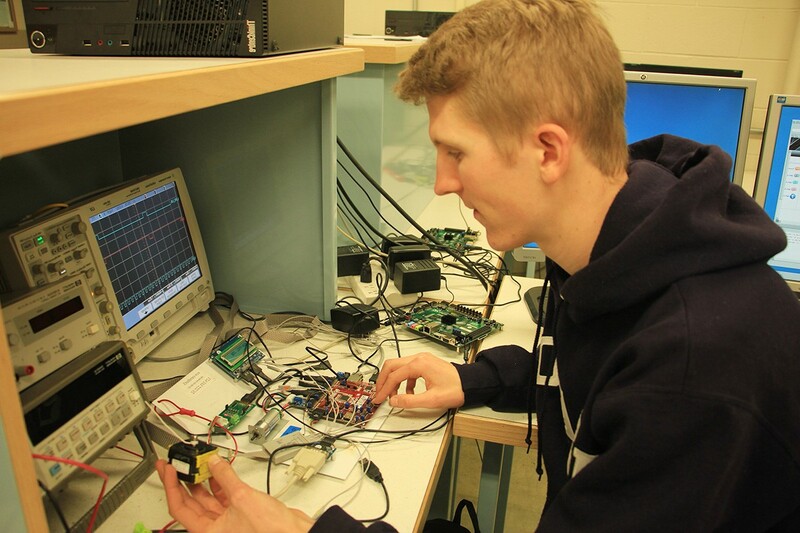 Phillip Kearns works in an engineering lab. The system Kearns is creating is an example of biosignal acquisition technology, which uses the body’s electrical impulses to trigger devices. Kearns’ system uses brainwave signals to control a camera, asking it to take pictures, videos or time-lapse videos of anything the user is looking at. The system can also be activated with changes in the user’s heart rate or with hand motions. “The end goal was to demonstrate a proof-of-concept that utilized wearable computing, biosignal acquisition technology, and signal analysis in order to provide an intuitive, innovative and hands-free way to control a camera,” Kearns says. Kearns’ project also demonstrated that the device has the ability to be used with prosthetics. Near the end of his internship, Kearns and his mentor worked with a pair of high school students. The students had made a 3-D printed prosthetic hand, and Kearns connected the hand to a small electric motor and his EEG device, allowing wearers to use their brainwaves to tighten the strings on the fingers of the hand in the same way that our own tendons are used to grip objects. Kearns hopes that one day his device will not only be used in the medical field, but also in everyday usage, such as being able to control the lighting in homes based on people's emotions, or used by pilots or drivers to operate on-vehicle electronics without taking their hands off the controls. His research has been recognized on a national scale, too: This spring he was selected as an honorable mention for the prestigious Barry Goldwater Scholarship and Excellence in Education Program. 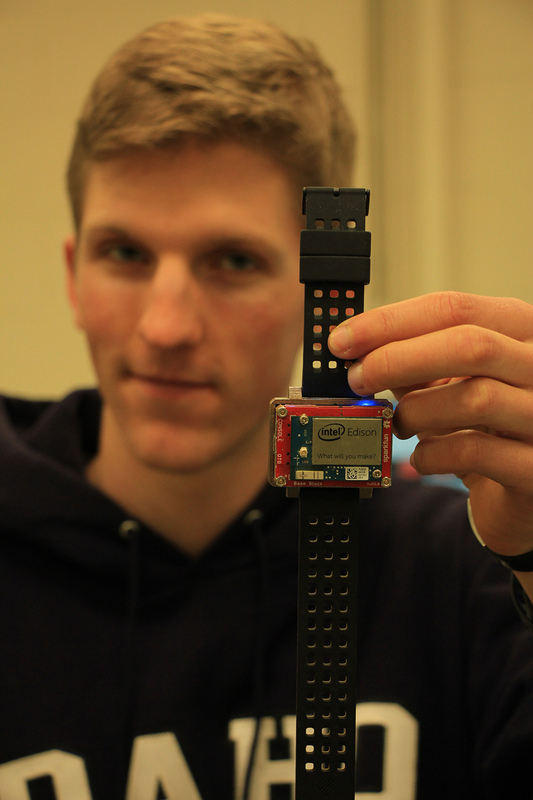 Phillip Kearns is shown with his wearable biosensor. Writer: Morgan Ella Fay Ward is a junior from Fruitland majoring in English and minoring in history. She hopes to go on to a graduate program to obtain a doctorate and teach at a university level. Photographer: Yishan Chen is an international student from Kumming, China, and is majoring in physical education. He is proud to be a photographer because it’s a job he loves and enjoys.